Congratulations! You are about to enter the exciting world of bioprinting! Your Allevi offers you an accessible, easy to use platform for developing 3D tissues. To start, we suggest this first bioprint of a Pediatric Bronchi with our user-friendly Pluronic F127 material. This first bioprint will allow you to familiarize yourself with your Allevi as well as the bioprinting process in general. Your Bioprint should look like this when completed(*blue food dye added for visual effects). Carefully push the material to the top of the syringe with a lab marker, then cap with a 30 gauge needle. Place your syringe into your Allevi. Allow Pluronic F127 to warm to room temperature before printing. Finally, place a petri dish into the bed plate. 1. Download the Allevi software. (If you are using an older version of the software and need help, please contact [email protected]). 2.Create an account or log in with your credentials. 3. Go to the "Devices" tab and either add a new device or connect to your already added Allevi. 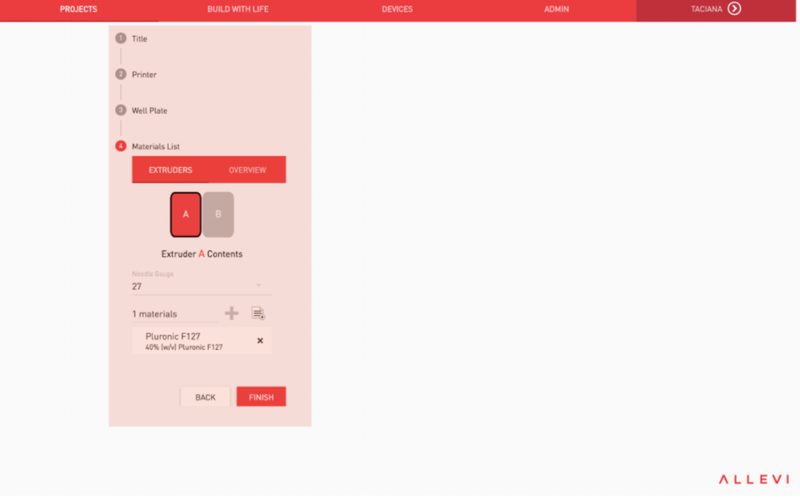 If adding a new device, enter the device ID that came with your bioprinter. 4. Now navigate to the "Projects" tab and open up the left sidebar. Click on "New Project" to create your first Allevi project! You can add a title, a description, and even tags that best describe your print. 5. Click on the + button to add an entry. To create your print, click on "Allevi Print". 6. 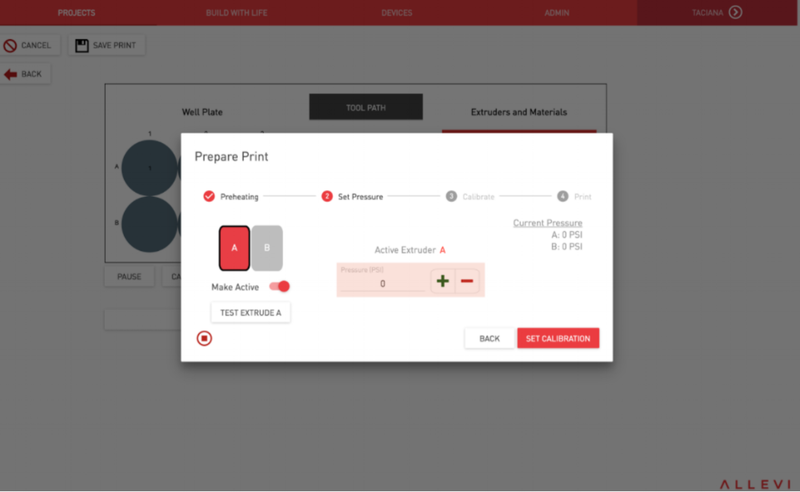 Insert your print title, choose your printer and well plate, and finally define your needle gauge and material for each extruder. 7. If you selected a multi-well plate, you can define the upload files, extruder properties and crosslinking profiles for each well separately! Just click on the desired well and select the appropriate options. 8. For each well (or for your petri dish) select the STL file(you can download here), and the Pluronic F127 slicing profile. Don't forget to select the extruder you wish to use on the bottom left corner of the STL preview. 9. By clicking on extruder A or B, choose your extruder properties. For pluronic F127, we are using a 23˚C temperature and only extruder A. 10. Next, set up your crosslinking profile. In this case, for pluronic, no photocrosslinking will be used. 11. Slice your STL file and click "Finish". Now that you have chosen all of your print options, you can calibrate your Allevi 2. 12. Preheat your extruder by clicking on A or B. For Pluronic F127, room temperature will be used to print. 13. Select your desired pressure. For Pluronic F127, set it to 22 PSI. 14. Adjust your extruder in x, y and z positions so that the needle is close enough to the dish in order to draw a material line once it moves. You can also test extrude your materials to help you with this step. 15. 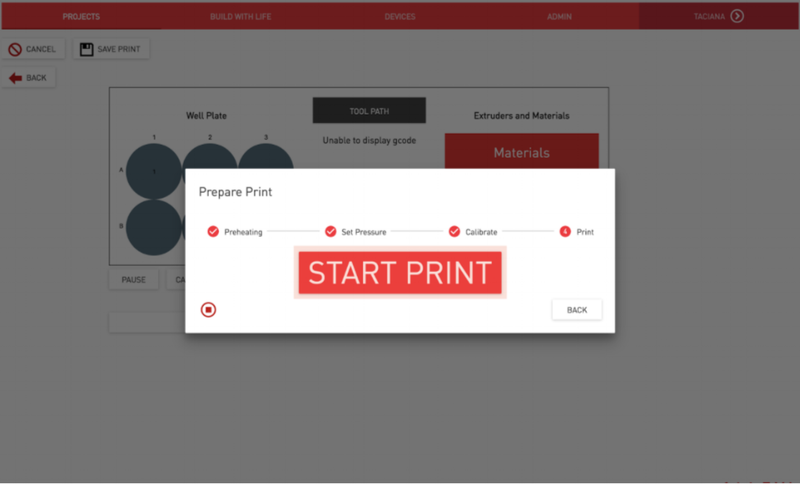 After calibration, you are ready to print!